2-1/4" x 1-3/8" base. 2-7/16" base to center of rail. Large faceplate for secure attachment to wall. Solid construction for increased strength. Base: 2-13/16"H x 1-1/2"W. 2-3/4" base to center of rail. Bin pak, polybagged 2-1/4" x 1-3/8" base. 2-7/16" base to center of rail. 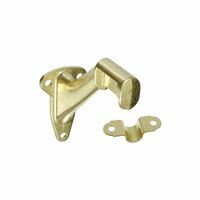 National Hardware Handrail Bracket, Series: SPB106, 250 lb Load Capacity, Die Cast Zinc Body, Steel Strap, Bright Brass, For Securing Wooded Handrail to Wall, Stud or Other Structurally Sound Surface Economy handrail Includes screws. 3-1/4" projection. 2-15/16" base height. 3/4" x 2-3/8" clip. Accommodates 7/8" handrail. Polybagged. Economy handrail Includes screws. 3-1/4" projection. 2-15/16" base height. 3/4" x 2-3/8" clip. Accommodates 7/8" handrail. Polybagged. Economy handrail Includes screws. 3-1/4" projection. 2-15/16" base height. 3/4" x 2-3/8" clip. Accommodates 7/8" handrail. Polybagged. National Hardware Handrail Bracket, Series: MPB112, 3.31 in Length, 1.43 in Width, 250 lb Load Capacity, 3 Mounting Holes, Fasteners: (3) NO 10 Oval Head Wood Screws, Die Cast Zinc Body, Steel Strap, White, For Securing Wooded Handrail to Wall, Stud or Other Structurally Sound Surface Secures wooded handrail to wall, stud or other structurally sound surface. Bracket and strap are design to adjust to any stairway angle. Maximum distance between brackets not to exceed 48 inches. Safe working load: 250 lbs. Visual-pack. Secures wooded handrail to wall, stud or other structurally sound surface. Bracket and strap are design to adjust to any stairway angle. Maximum distance between brackets not to exceed 48 inches. Safe working load: 250 lbs. Visual-pack. Secures wooded handrail to wall, stud or other structurally sound surface. Bracket and strap are design to adjust to any stairway angle. Maximum distance between brackets not to exceed 48 inches. Safe working load: 250 lbs. Visual-pack. Secures wooded handrail to wall, stud or other structurally sound surface. Bracket and strap are design to adjust to any stairway angle. Maximum distance between brackets not to exceed 48 inches. Safe working load: 250 lbs. Visual-pack. Economy handrail Includes screws. 3-1/4" projection. 2-15/16" base height. 3/4" x 2-3/8" clip. Accommodates 7/8" handrail. Polybagged. Secures wooded handrail to wall, stud or other structurally sound surface. One piece, single screw design. Safe working load: 250 lbs. Secures wooded handrail to wall, stud or other structurally sound surface. Bracket and strap are design to adjust to any stairway angle. Maximum distance between brackets not to exceed 48 inches. Safe working load: 250 lbs. Visual-pack. Economy handrail Includes screws. 3-1/4" projection. 2-15/16" base height. 3/4" x 2-3/8" clip. Accommodates 7/8" handrail. Polybagged. 2-1/4" x 1-3/8" base. 2-7/16" base to center of rail. Economy handrail Includes screws. 3-1/4" projection. 2-15/16" base height. 3/4" x 2-3/8" clip. Accommodates 7/8" handrail. Polybagged. Secures wooded handrail to wall, stud or other structurally sound surface. One piece, single screw design. Safe working load: 250 lbs. Secures wooded handrail to wall, stud or other structurally sound surface. One piece, single screw design. Safe working load: 250 lbs. Secures wooded handrail to wall, stud or other structurally sound surface. Bracket and strap are design to adjust to any stairway angle. Maximum distance between brackets not to exceed 48 inches. Safe working load: 250 lbs. Visual-pack. Secures wooded handrail to wall, stud or other structurally sound surface. Bracket and strap are designed to adjust to any stairway angle. Maximum distance between brackets not to exceed 48 inches. Mini-pack bagged. Secures wooded handrail to wall, stud or other structurally sound surface. One piece, single screw design. Safe working load: 250 lbs. Secures wooded handrail to wall, stud or other structurally sound surface. One piece, single screw design. Safe working load: 250 lbs. Secures wooded handrail to wall, stud or other structurally sound surface. One piece, single screw design. Safe working load: 250 lbs. Secures wooded handrail to wall, stud or other structurally sound surface. One piece, single screw design. Safe working load: 250 lbs. 2-1/4" x 1-3/8" base. 2-7/16" base to center of rail.